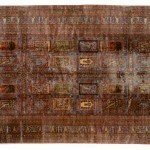 As President’s Weekend approaches, we are reminded that a Sarouk style rug was manufactured by Dilmaghani Carpets for a United States’ Presidential Library. 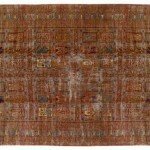 A huge piece, it required a special oversized loom and took two years to make! 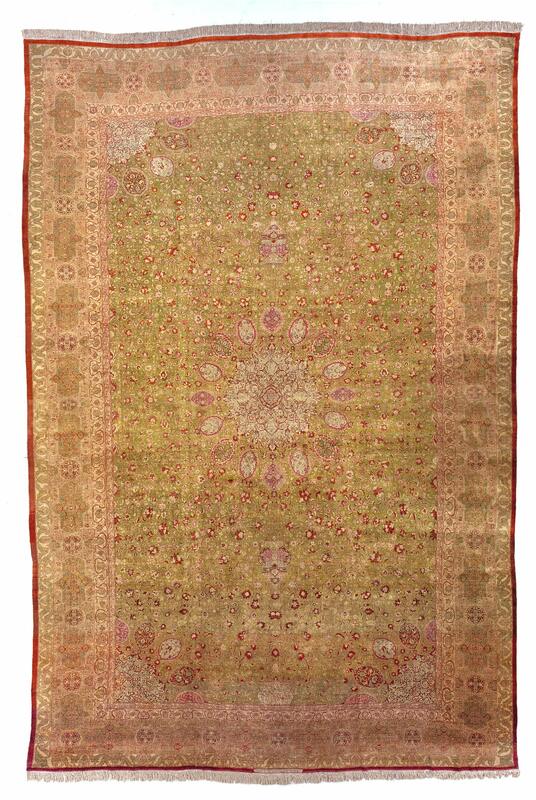 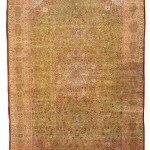 Dilmaghani has a beautiful inventory of Sarouk rugs in every size. 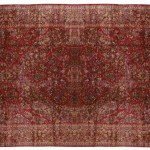 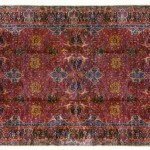 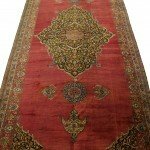 A Classic Persian pattern, the Sarouk design has particularly been beloved in the United States for over a century. 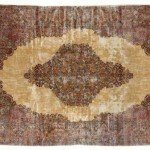 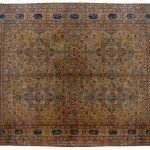 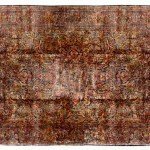 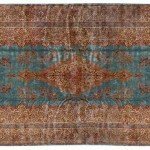 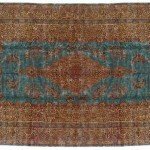 In fact, a particular group of Sarouk designs, are now referred to as “American Sarouks.” Whatever your design choice may be, you’ll surely find the regal rug for your home or office within our vast inventory. 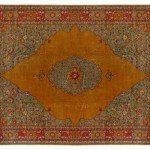 Welcome to Dilmaghani’s Large, Palace and Oversized Rug and Gallery. 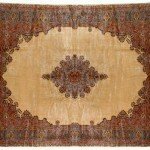 An image Gallery of our Largest mansion hand knotted Oriental area rugs. 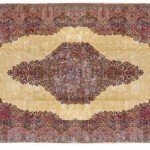 Sample of our large rug and oversized Palace rugs. 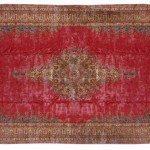 Browse the gallery or click for larger images and details. 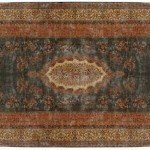 More information about our large rug collection at the bottom of this page. 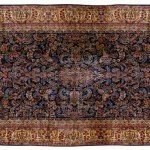 History of large carpets: Prior to the 18th century, Oriental rugs were rarely affordable by those other than royalty, notable dignitaries and the highly affluent. 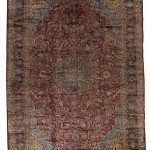 With exceptions to the previously mentioned, hand knotted rugs in the West were often exclusively displayed as above-floor coverings atop tables, adorning chairs and couches. 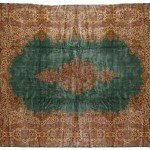 Holbein, The Ambassadors. 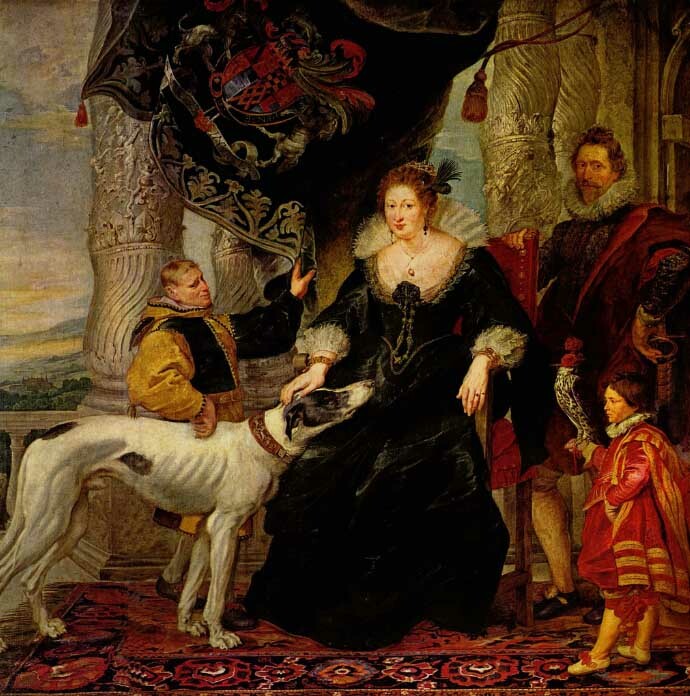 The National Gallery, London, England. 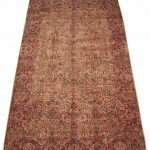 Although fully intended and woven for use and utility under foot, it was not until the mid-18th century that much of Western culture began moving rugs onto the floor, and in small sizes at that. 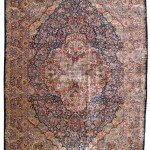 In 19th century, however, a revival of 16th century Safavid inspired rug production continued in Persia. 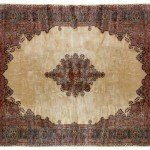 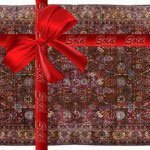 Growing wealth in America and appreciation for fine rugs and carpets peaked high demand for precious Rugs of the far East. 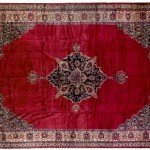 At times, rugs made were abnormally large and unusual in size. 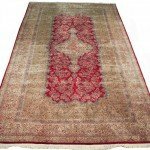 Well-to-do families in Europe, Asia and America identified well with these carpets not only for the aesthetic appeal, but the symbol of status. 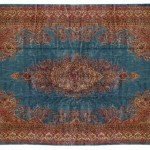 In consideration of depictions of rugs in great paintings, and known examples of fine rugs still in existence from the 16th, 17th and 18th centuries, a clear momentum was underway. 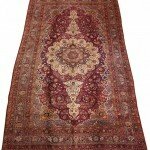 There is little prestige close to that of possessing a carpet made in the spirit of those reserved, enjoyed and commissioned for the most prestigious members of society through the ages. 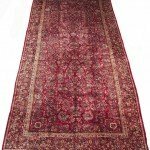 Large rugs today: Popularity in large and oversized rugs increases, as for centuries past, they exude an extraordinarily regal statement. 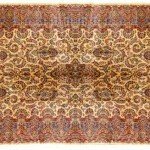 Massively scaled design elements are unusually more descriptive of overall motifs. 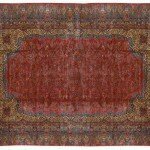 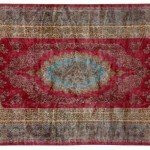 A Palace rug under foot is exhilarating, with proportions in a grand and epic level. 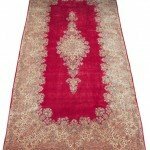 Whether bold or subtle, the aesthetic satisfaction of a large rug in context of a large room is virtually unparalleled by any other interior investment. 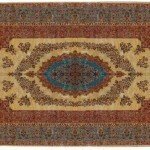 Oversized rugs and carpets often fall into several “categories”. 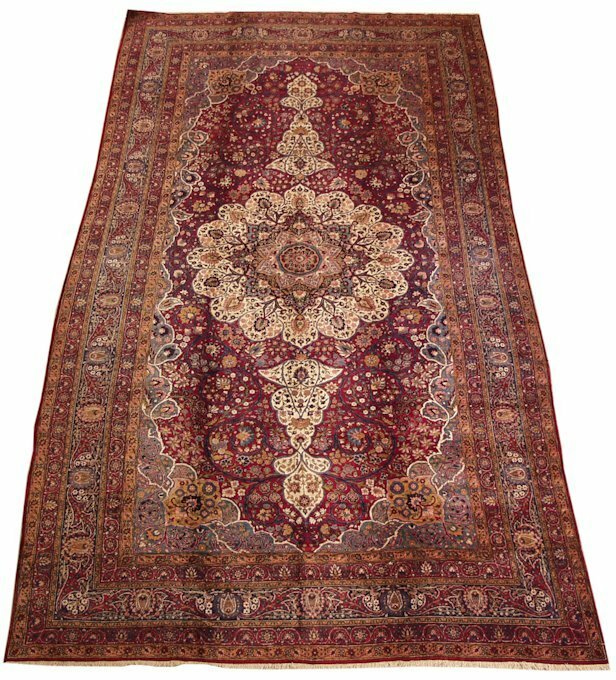 Terms such as “large”, “mansion”, and “palace” may be used to describe rugs of unusual size or unique dimensions, although are archaic and nondescript when reference to actual measurements. 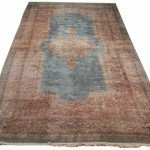 Custom and unique looms are made to create hand knotted carpets of large or unusual proportions: Those which exceed 12′ +/- ” in width. 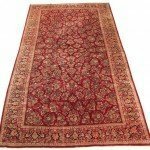 Therefore, a large, oversized rug is generally greater than 13′ wide. 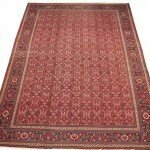 Some carpets may also be considered large and oversized if they exceed 22′ in length, provided they do not fall under the category of narrower rugs such as “runners” or “gallery rugs”. 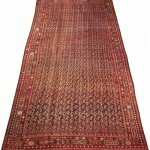 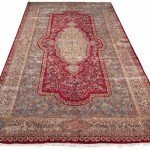 Dilmaghani’s Large Rug and Oversized Carpet Collection: The large and oversized carpets seen at the top of this page (exclusive to Dilmaghani) are of very fine quality, condition, vintage (semi-antique and antique) as well as unique in size and shape. 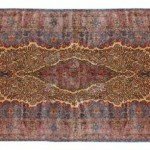 Select Kerman rugs in stock bear our Crown trademark: A 150-year-old representation of our reputation and excellence in Oriental rug production. 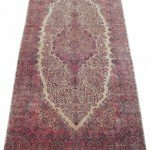 Our sample gallery of large and oversized carpets are all available for acquisition via online purchase or local viewing by appointments only. 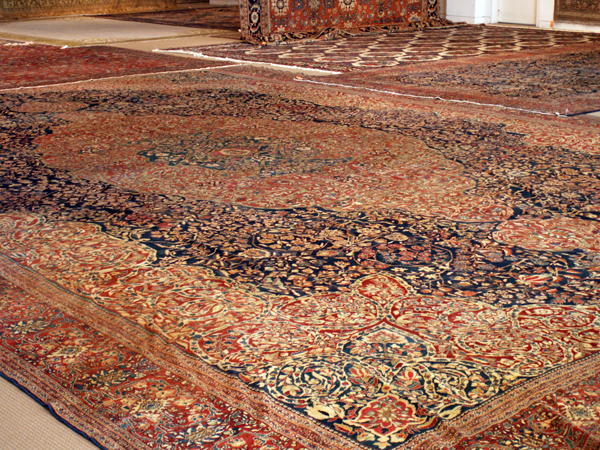 For special size requests, please contact our sales department at 914.472.1700. 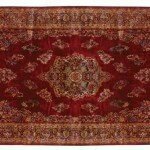 Oversized Persian rugs seen in the gallery above are from all regions and provinces of Persia including Kerman, Tabriz, Sarouk, Shiraz, Kazvin, Yezd and many more. 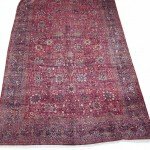 Other countries of weaving origin include Bulgaria, Pakistan, as well as India. 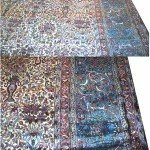 Sizes included are 11×23, 11×24, 12×23, 12×24, 12×26, 13×23, 13×24, 13×28, 14×21, 14×22, 14×23, 14×24, 14×25, 14×26, 14×27, 15×19, 15×22, 15×23, 15×26, 15×30, 16×22, 16×24, 16×25, 17×24, 17×27, 19×43 and many more rare, unusual, and unique sized large, oversized hand knotted rugs and carpets. 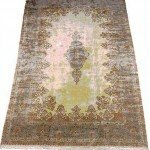 For special size requests or more information please contact our sales department at 914.472.1700.